“Fabric” is a loosely used term, which today creates more confusion instead of offering direction. What exactly is a Fabric ? What is a Switch Fabric? Greg Ferro did a post here explaining how Ethernet helped the layer 2 switch fabric evolve. Sadly the use of switch fabric did not stop there. And this is the part where the confusion trickles in. The structure of an ASIC, e.g., the cross bar silicon fabric. The hardware forwarding architecture used within layer2 bridges or switches. The hardware forwarding architecture used with routers, e.g., the Cisco CRS and its 3-stage Benes switch fabric. 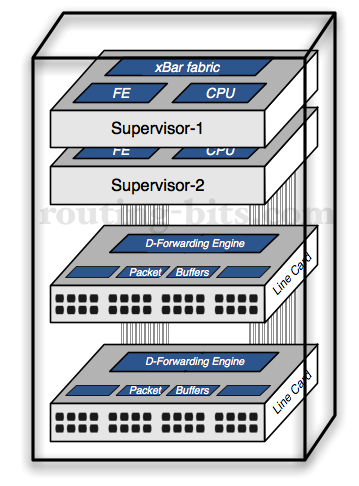 Storage topologies like the fabric-A and fabric-B SAN architecture. Holistic Ethernet technologies like TRILL, Fabric-Path, Short-Path Bridging, Q-Fabric, etc. A port extender device that is marketed as a fabric extender (a.k.a. FEX) namely the Cisco Nexus 2000 series. In short, a switch fabric is basically the interconnection of points with the purpose to transport data from one point to another. These points, as evolved with time, could represent anything from an ASIC, to a port, to a device, to an entire architecture. In this post I would like to cover the base of what is needed to know about the Cisco Fabric Extender that ships today as the Nexus 2000 series hardware. Supervisor module/s are responsible for the control and management plane functions. Linecards or I/O modules, offers physical port termination taking care of the forwarding plane. Encapsulating mechanism to identify frames that travel between the different components. Control protocol used to manage the linecards e.g., MTS on the catalyst 6500. Most linecards nowadays have dedicated ASICs to make local hardware forwarding decisions, e.g., Catalyst 6500 DFCs (Distributed Forwarding Cards). Cisco took the concept of removing the linecards from the modular switch and boxing them with standalone enclosures. These linecards could then be installed in different locations connected back to the supervisors modules using standard Ethernet. These remote linecards are called Fabric Extenders (a.k.a. FEXs). Three really big benefits are gained by doing this. The reduction of the number of management devices in a given network segment since these remote linecards are still managed by the supervisor modules. The STP footprint is reduced since STP is unaware of the co-location in different cabinets. Another benefit is the cabling reduction to a distribution switches. I’ll cover this in a later post. Really awesome for migrations. Lets take a deeper look at how this is done.